Master data such as item masters and business partner master data should be in sync across all organizations, so that the same data is used across the companies. This establishes a common frame of reference for analyzing the performance of a business unit, interpreting reports from two different subsidiaries, and gaining a consolidated view such as aggregate spend or inventory holdings across all operations. Having common master data eliminates the manual effort associated with aggregating data across your organizations. With the Company Template configuration, user can specify which master data can be sent from or received in a SAP Business One Company. 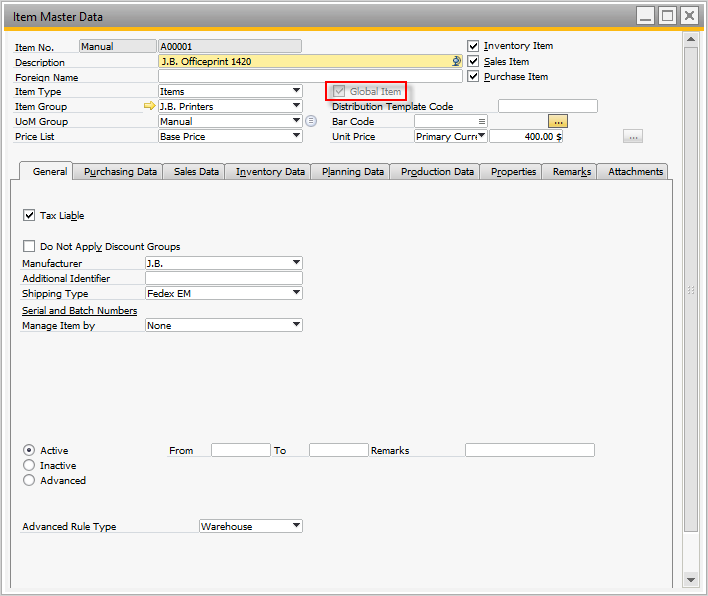 For each master, user can also specify the field list to be replicated between the SAP Business One Companies. The user can create and customized the company template from the intercompany administration console. 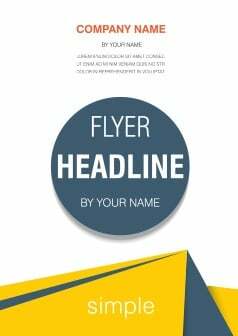 The customized company template can be assigned to the branch companies configured in the landscape. 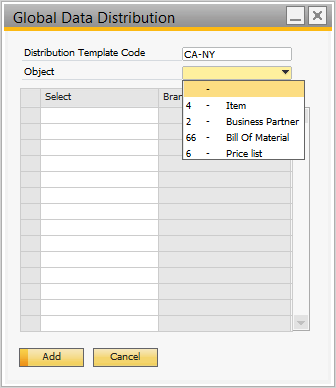 For the item master data, business partner master data, bill of materials and price list masters, the user can choose which specific records are to be shared between SAP Business One companies. Selecting these check boxes on these master replicates the master to all branch companies for use in interbranch transactions. 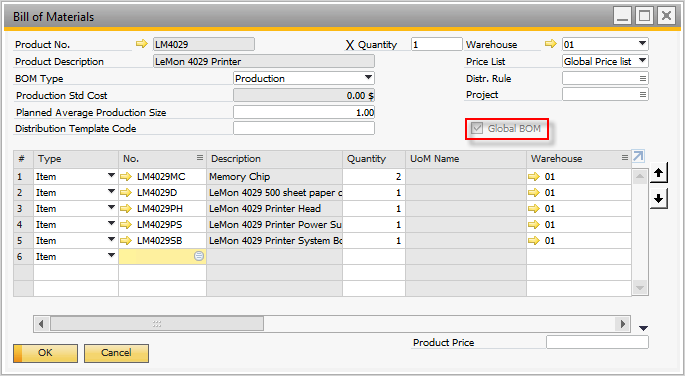 Users can define data distribution templates to replicate specific global business partner, global item master, global bill of materials, and global price lists masters to specific branch companies. In the Global Data Distribution Template window, specify a Template Code. 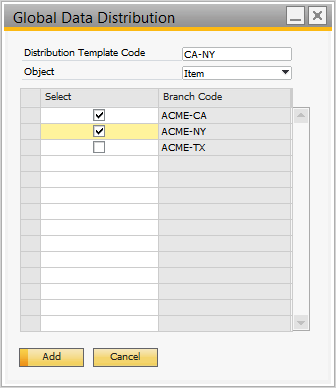 From the dropdown list in the Object field, specify an object for the template. In the Branch Code field, select the branch to which you would like to replicate the data. To save the distribution template to the database. choose Add. Global data authorization allows administrators to define users who will be allowed to add, update, or remove global master data. With the help of authorizations feature in SAP Business One, administrator can restrict the user to view, create, and update the complete masters. However, the authorizations feature in SAP Business One cannot be used specifically to add, update or remove the Global masters. The Intercompany Global data authorization feature help you to achieve this. To assign the global data authorization to the user, Go to Administration -> Setup -> Intercompany -> Global Data Authorizations. 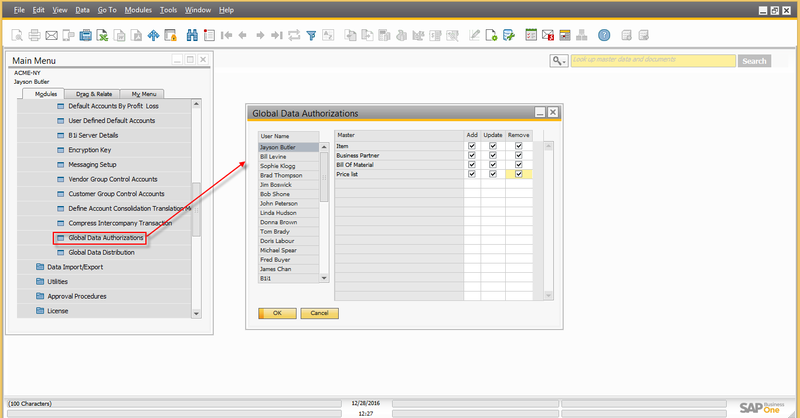 On Global data authorization screen, a list of all users is displayed on the left hand side and on the right hand side, system provide the Add, Update and Remove authorizations. Assign the relevant authorization to the user and choose update. Sales and ServiceBased on this setup, the service masters (Contract Templates, Equipment Card, and Service Contract) are replicated to branch companies. The Intercompany integration solution enables you to replicate UDF data across branch companies. You can choose to replicate custom UDFs on item master data, business partner, and marketing documents supported by the document exchange cycle. 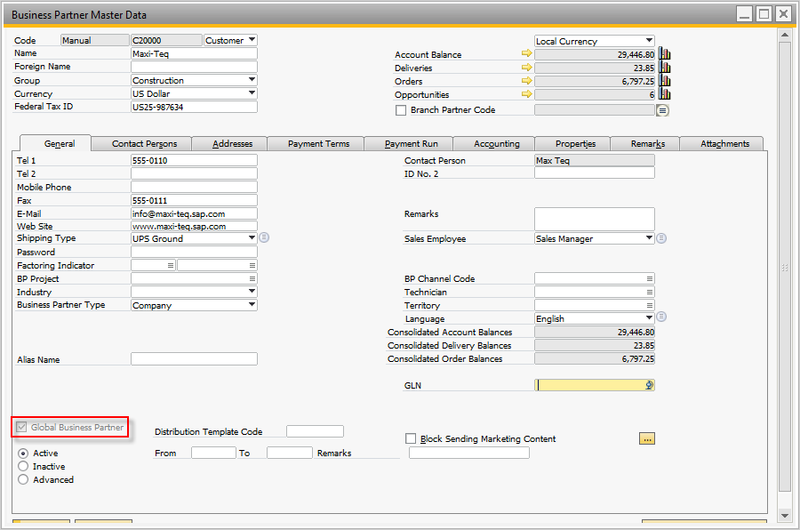 Users can also choose to replicate custom UDFs on journal entries and journal vouchers during consolidation processing. 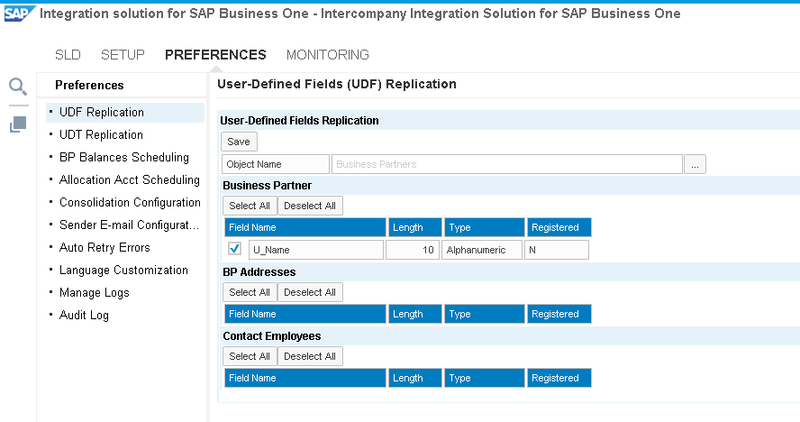 The administrator can configure the User Defined Fields (UDFs) replication from the preferences option of intercompany administration console. UDFs have the same name across all branch companies. UDFs have the same data type across all branch companies. UDFs have the same length across all branch companies. The administrator can configure the solution to replicate UDTs data between branch companies similar to the master data replication process. 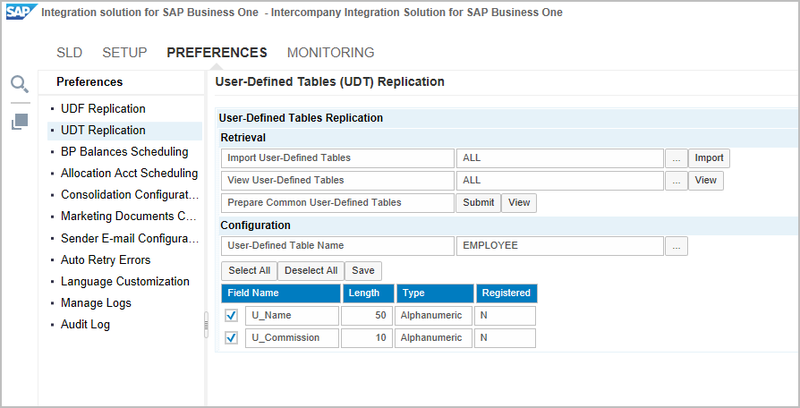 The administrator can configure the User Defined tables (UDTs) replication from the preferences option of intercompany administration console. By default, intercompany solution replicates following masters in all localizations of SAP Business One. User can use company template configuration feature to replicate following additional masters. 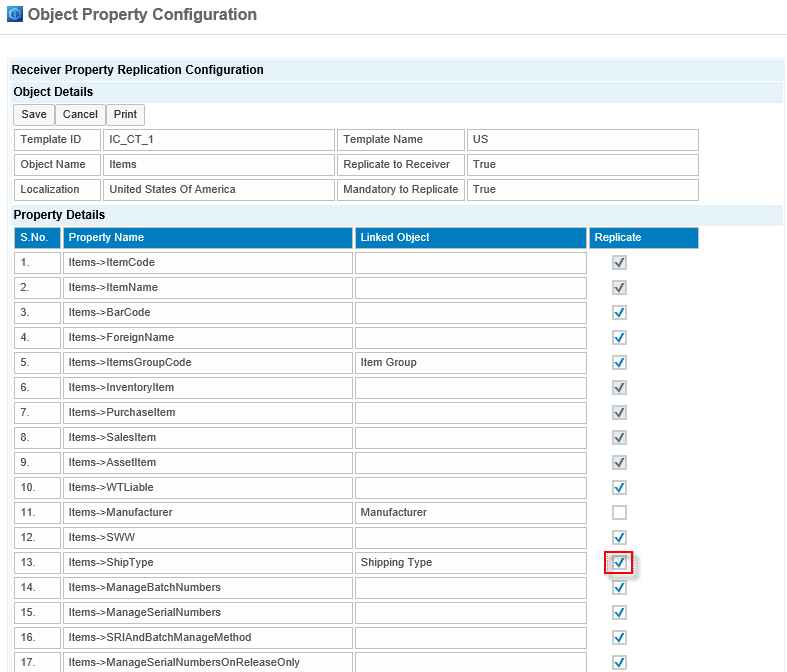 Using company template configurator, at any given time user may enable the field replication for any master which is not replicated by default. To know how to enable the field, Let’s take the example of Item master where we enable the replication of shipping type field and then we assign the template to Branch companies. In the intercompany administration console, choose Company Template under the setup menu. Company template configuration window is displayed. In the template name, choose the default template and in localization, choose the company localization (in our example the US localization). As you cannot make the changes in the default template, so make the copy of template and change the name of the template to “US” and Press Save. Now go to Item Master, and choose Receiver Property List. In Object property configuration window, enable the replication of ship type field. As ship type field is linked to Shipping type master then this master will also be enabled for replication on saving the object property configuration. Please note Mandatory properties are selected by default and user cannot enable or disable them for replication. Now save the object property configuration and then save the company template. Company template is ready for use, now assign the template to the branch companies in the intercompany landscape. The shipping type master and shipping type field on item master will now start replicating. Similarly, you can enable the replication of other fields and masters in intercompany solution.